Explore the process of both batik and tie dye and make your own imaginative patterns and designs in our classes. You will learn the basics of batik or tie dye and explore the process of preparation of hand-dyed textiles. At the end, you will take home your own personalized product. Shibori Itajime is an ancient dyeing technique which produces patterns on fabric. The fabric is placed between two pieces of wood, or tied with rubber bands. When dyeing the fabric, the barriers prevent the dye from penetrating the fabric they cover, resulting in various unique patterns throughout the fabric. Your participation in Batik Boutique's Shibori Class also contributes to the livelihood of underprivileged women across Malaysia,. Apart from bringing home a handmade souvenir, you are leaving something behind - the chance for our batik artisans to gain a sustainable income and skills. 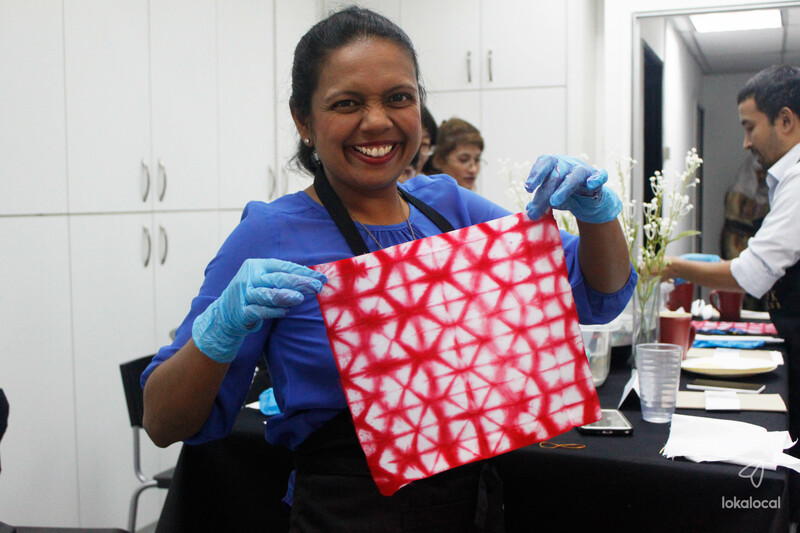 Let us know what you want to make as an add-on and join our Shibori Class today. Learn the basics of shibori, then go wild with creativity! Our local expert will share a brief history of batik, tie dye method and the story behind its social enterprise. After some demonstrations, you can try your hands at making your own designs. Apron will be provided. Just wear comfortable clothes.